My Take on it – It took me over 22 years to finally see this movie and I now wish I hadn’t seen it; it would have left me believing that Puzo and Coppola could make the whole Godfather saga a success. Alas, I did watch it and was very disappointed. The story just wasn’t very captivating. The first two movies made sense with a continuity, but this one just was all over the place. Sometimes when a group of characters in a movie are revisited years later, you still find them interesting, but this movie basically only brought three characters back, Michael, Kay and Connie. Most of the other characters had either been killed in previous Godfather flicks or were “murdered” by the writers because they couldn’t come to an agreement of a fee (Robert Duvall, I’m talking about you). The rest of the characters are older versions of kids from the first two movies, invented bastards in order to bring a new character into the movie to work with Don Corleone or a new adversary who apparently has been around for something like 50 years, but wasn’t in either of the previous movies. If any of these new characters were interesting, maybe I’d have enjoyed it more, but unfortunately, they were not. Bridget Fonda has a small part as a reporter who I thought would have more to do in the movie, but within the first hour, she disappears and doesn’t return (and she isn’t “sleepin with the fishes” like Luca Brasi). Bottom Line – Not as great as the previous two Godfather movies and they probably shouldn’t have made it. If you enjoyed the first two Godfather movies, maybe you should skip this one in order to keep the greatness of the first two without them being diminished by this one. I think this movie gets unfairly slammed a lot of times. Yes, it’s not as good as the first two GODFATHERS but it’s nowhere near as bad as some reviewers would make it out to be. And I’m sorry but I also don’t see Sofia Coppola as being that horrendous an actress. Maybe I’m just too forgiving. I dunno. I enjoy GODFATHER III. Thanks for your comment Derrick. I agree, but thats the problem with sequels. they will inevitably be compared to their predecessors. Some times it works in their favor (Terminator 2: Judgement Day(1991)) and other times they get panned for not living up to expectations. I purposely don’t discuss acting in general because I think that’s too subjective. I didn’t single out Sofia Coppola because in my opinion the story just wasn’t good enough, no great (or terrible) actor can have an effect on that. 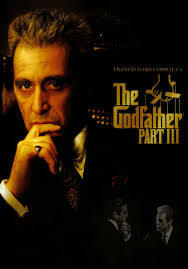 Perhaps if the movie was a stand alone story, it might have been better in my eyes, but I cant help but compare it to the first two Godfather movies. That always is the problem with sequels, isn’t it? Being compared to their predecessors? But then again, what else do you have to compare them to except the movie that came before it? And maybe the problem is that as an audience we have too high of an expectation for sequels? We’re always looking for the sequels to be better than the first one? But I’m playing Devil’s Advocate here. In fact, far as I’m concerned, there’s no reason to make a sequel unless you’re going to make a better movie than the previous one. Such as in the case of GODFATHER II which is universally praised as the rare sequel that is better than the first movie. The problems with GODFATHER III I lay at the feet of Francis Ford Coppola who really didn’t want to make the movie and actively resisted doing so for years.